The night before last, my husband and I attended the Royal Shakespeare Company’s new production of Antony and Cleopatra at Stratford-upon-Avon. Because we’ve enjoyed everything we’ve seen there before, we were sorely disappointed when the play failed to live up to our expectations. From the lack of enthusiastic clapping as the last act culminated into closing bows, we concluded we weren’t the only ones who’d found the evening’s entertainment lacking. In the lingering light cocooning the historic market town, we wracked our brains as to what had gone wrong. As usual the acting had been superb. Naturally in the company’s temporary location, we knew the stage set must ‘needs be” be limited; that we’d already figured in. Even the awkward juxtaposition of contemporary combat gear with the 17th century prose couldn’t account for our discontent. Settling back for an après theatre tipple in the comfortable lounge of our hotel, we concluded that the problem must lie not with the performance, but with the play itself. As neither of us had seen Antony and Cleopatra before, we satisfied ourselves that of all Shakespeare’s great plays this one just wasn’t our cup of tea. Next morning while sudsing my hair with lemon scented shampoo, I realised that we’d not appreciated Antony and his Cleopatra because they’d been portrayed as ordinary persons, just like you and me. No one likes to have their inadequacies flaunted – especially not when you’re paying for the privilege. Cleopatra had been petty and jealous, grasping for every possible reassurance of the potency of her feminine charms. Ladies, which of us have not at some point in our lives not behaved exactly the same way? And although admittedly Antony had once been brave and strategic, he was portrayed now as weak-willed and wooly; instead of demonstrating the strength of character expected of a world leader, he was more like a lovesick schoolboy with greying hair. Haven’t we all seen more than a few of those in our time? But worse, this is precisely how Shakespeare had drawn them – with all their mortal flaws shining bright and new as evening stars. Although clearly the great bard had expected us to see through this gauzy veil to the “new heaven, new earth” of which Antony frequently spoke, it was hard to get hooked on just the promise of a better life beyond. 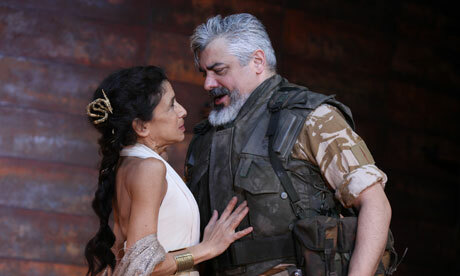 The problem is that with their deaths Antony and Cleopatra did fulfil this otherworldly promise. I suppose that for the good Christian audiences for which this play was originally composed, that would have been more than enough. However the psychologically sophisticated audiences of today can never be satisfied with a glimpse of future redemption; we’ve been told that if only we do enough ‘character work’, we’ll be rewarded with ‘new heaven’ and ‘new earth’ in the now. That none of the dramatis personae in this play displayed the least inclination of achieving this Holy Grail of individuated wholeness was disappointing to say the least. But to my mind, the key question is whether their lack of motivation says more about the shallowness of 17th century values or of our own.